Therapeutic proteins are protein-based drug candidates bioengineered in the lab for pharmaceutical and clinical applications. Based on their pharmacokinetics, the candidates can be divided into groups that (1) replace a defective or abnormal protein, (2) augment an existing path in vivo, (3) provide a new function or activity in vivo, (4) interfere with activities of a molecule or organism and (5) deliver encapsulated proteins or compounds including, cytotoxic drugs, radionuclide or effector proteins. In a recent study published in Microsystems & Nanoengineering, Travis W. Murphy and co-workers at the Departments of Chemical and Biological Systems Engineering at Virginia Tech developed a cost-effective, point-of-care synthetic and purification platform for protein engineering. 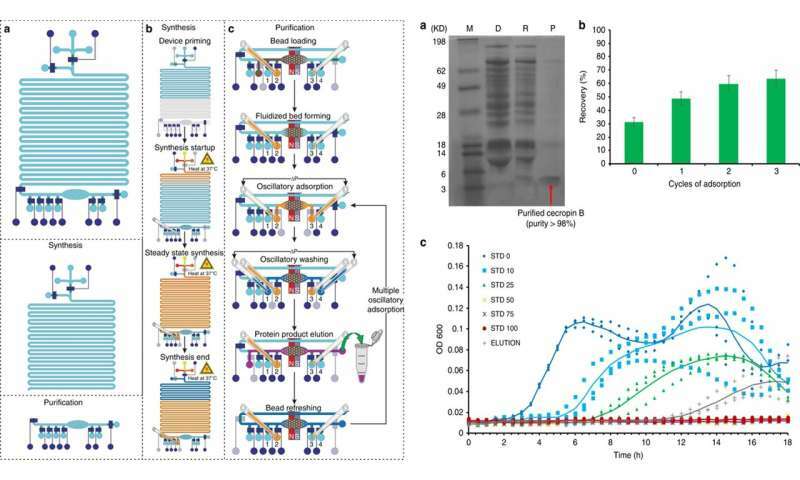 They built an integrated microfluidics "Therapeutics-on-a-Chip (TOC)" device for cell-free, therapeutic protein synthesis and therapeutic protein purification in a single setup. The ability to synthetize therapeutic proteins in a point-of-care setting, can rapidly decrease costs of storage and transportation during global distribution in resource-poor regions and contribute to the concept of frugal science. A majority of proteins are currently produced using cell culture systems such as the recombinant Escherichia coli, yeast, mammalian cells and plant cells for large-scale manufacture, after which they are globally distributed from centralized foundries. However, the limited half-life of these synthetic proteins requires low temperature storage and shipment facilities that are challenging for patients living in remote and low-resource regions. In the present work, Murphy et al. first demonstrated the working principles of the device by expressing and purifying a reporter protein - green fluorescent protein. Followed by the use of TOC to produce cecropin B – an antimicrobial peptide widely used to control biofilm diseases. The scientists successfully synthesized and purified cecropin B to produce a concentration of 63 ng/µL in six hours, with a purity of 92 percent, followed by confirming its antimicrobial properties with a growth inhibition assay. The TOC technology provides a new platform for point-of-care protein synthesis and purification for accessible clinical therapeutics. The state-of-the-art devices presently in use for point-of-use protein synthesis includes a refrigerator-sized system that spans a two-day production-purification cycle to manufacture 800 doses of a drug per day. Yet the capital cost associated with such a system is not feasible in the developing world, where the need for speedy production of mass therapeutics for distribution outweighs mass therapeutics production for long term storage. In the TOC system developed by Murphy et al. 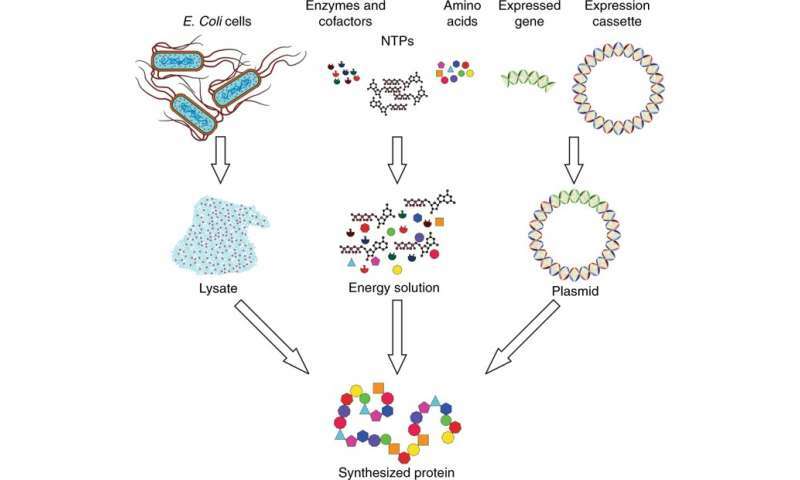 the scientists accomplished point-of-care synthesis and purification of therapeutic proteins using a cell-free protein synthesis (CFPS) process. 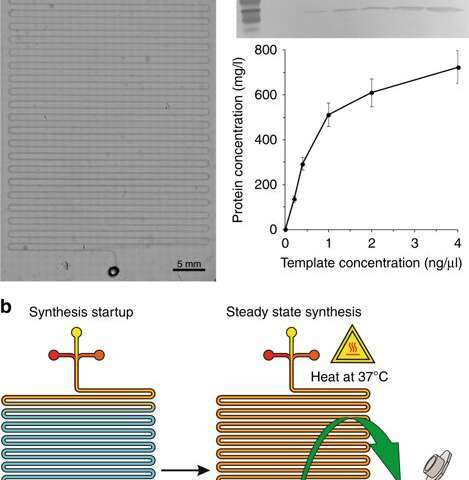 In this system, recombinant proteins were expressed without the use of living cells, suited for point-of-care production, where lyophilized starting materials could remain stable during storage across a broad temperature range. Murphy et al. used soft-lithography based polydimethylsiloxane (PMDS) molding to fabricate the devices; building multilayers using micromechanical valves. 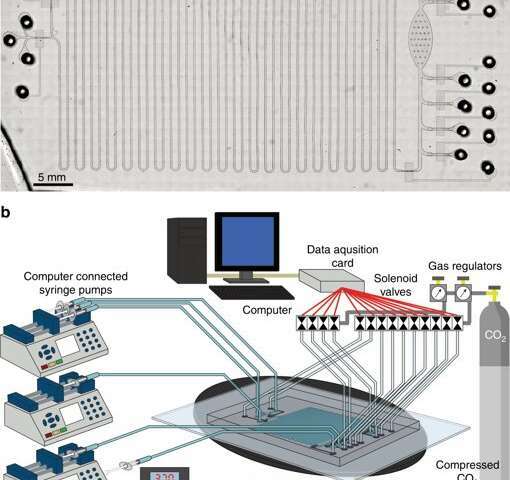 During the first stage of device design in the CFPS reactor, the scientists fabricated a serpentine channel microfluidic chip, similar to previous studies for on-chip protein synthesis. The microfluidic device contained inlets connected to a syringe pump placed on the heating stage of a microscope, where three inlets received (1) cell lysate, (2) CFPS reaction buffer and a (3) DNA template into the long serpentine channel (approximating 130 cm) with one outlet. The scientists fed the three reaction components at a combined flow rate of 0.15 µL/min driven by a syringe pump for a residence time of 1.5 hours. They heated the reactor with a stage heater (37 degrees C) and modeled the setup using COMSOL Multiphysics software to verify device mechanics, for optimal on-chip diffusion-based mixing and reaction. To validate the operating principles of the device, Murphy et al. synthesized the reporter protein, GFP using a variety of DNA templates. The system produced volumes of protein at a constant reaction time. In the second phase, Murphy et al. designed a microfluidic device for protein purification based on a high efficiency adsorption and washing protocol, as demonstrated by the same research team previously. They operated the device using solenoid valves to control the single micromechanical valve and associated oscillatory pressure pulses to perform protein purification in four major steps. In the work flow, steps were (1) bead loading, (2) protein adsorption, (3) washing and (4) elution. To optimize the process, the scientists compartmentalized the method to three different workflows. Murphy et al. then varied the conditions affecting the results of protein purification to achieve product purity as high as 98.5 percent, with a yield of 54.6 percent of the product, outperforming other methods. The integrated system for cell-free protein synthesis and purification. a Micrograph of integrated CFPS + P platform. b Overview of integrated CFPS + P platform setup. The system consists of computer-controlled solenoid valves and syringe pumps connected to a microfluidic device placed on a heating stage. Credit: Microsystems & Nanoengineering, doi: 10.1038/s41378-019-0051-8. In phase three, the scientists developed an integrated microfluidic platform with cell-free protein synthesis and purification (CFPS+P) for automation. They combined a continuous flow reactor and a batch purification device, although the two processes were not intrinsically compatible with each other to begin with. 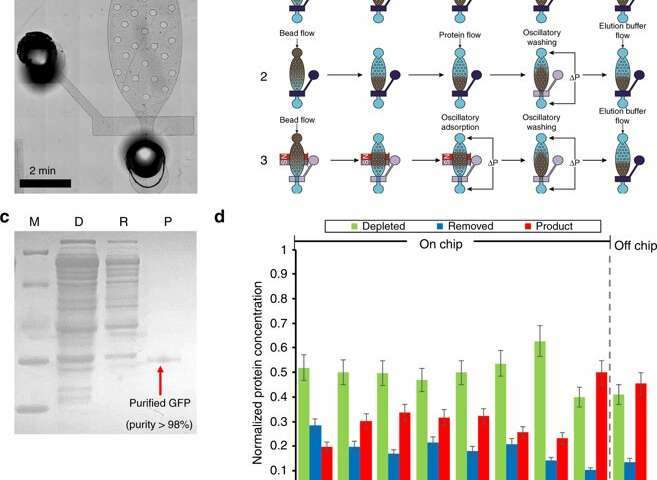 To accomplish adequate compatibility, they interfaced the two processes using a tube reservoir that stored the continuously produced protein on a chip, prior to purification. All apparatus used in the study to operate microfluidic system could potentially fit the size of a briefcase, making it a highly portable, therapeutic protein production system. In total, the fully integrated CFPS+P chip contained five major steps including, priming, protein synthesis, protein adsorption, washing and elution. In a sixth step, the scientists arranged bead refreshing. Murphy et al. used the serpentine synthesis channel as the individual synthesis module, after they synthesized the desired amount of protein, they shut down the setup from the purification module to initiate the subsequent process of purification. To test the workflow of the setup, the scientists used GFP and achieved a purity of 98 percent. LEFT: Overview and operation of the integrated cell-free protein synthesis and purification platform in 5 major steps: a) priming, b) protein synthesis, c) protein adsorption, washing, and elution, with an optional 6th step of bead refreshing. Credit: Microsystems & Nanoengineering, doi: 10.1038/s41378-019-0051-8. RIGHT: Cecropin B synthesis and purification using integrated CFPS + P microfluidic device. a) Tricine-PAGE of the cecropin B synthesized and purified by the integrated chip. M (marker); D (depleted): CFPS reaction mix after bead absorption; R (removed): removed contaminates in the purification buffer; P (product): purified AMP in the elution buffer. b) Optimization of cecropin B recovery using multiple adsorption cycles. c) Growth inhibition assays of E. coli conducted in triplicate, using the protein product (elution) after three adsorption/elution cycles by our device in comparison to cecropin B standards of different concentrations (0–100 ng/μl, denoted as STD 0-100). OD600 was measured every 30 min for 18 h. Elution with a concentration of 27 ng/μl in 60 μl solution was used. Trend lines that represent the average of three trials are added to guide the eye. Credit: Microsystems & Nanoengineering, doi: 10.1038/s41378-019-0051-8. After CFPS+P workflow optimization using GFP, the scientists used the same setup to optimize the conditions to synthesize cecropin B. By following the steps of expression, purification, electrophoresis and staining in the setup, Murphy et al. confirmed the successful production and purification of cecropin B and recovered soluble proteins to elute 63 ng/µL, with a purity of 92 percent. They then tested the bioactivity of cecropin B relative to E. coli inhibition to demonstrate successful antibiotic activity by inhibiting bacterial growth. In this way, therapeutic proteins synthesized and purified using the microfluidic setup demonstrated active and effective suppression of bacterial growth. The cost-effective system can be actively integrated in low resource environments for frugal science. Murphy et al. intend to completely automate the system based on ongoing optimizations in the future. They envision applications of the setup to engineer a range of diverse therapeutic proteins for cost-effective point-of-care production.